Whether you have the important files burned on a CD or DVD archive, or just about any kind of digital materials that you intend to put for storage or share, you can always check its integrity with FastSum. 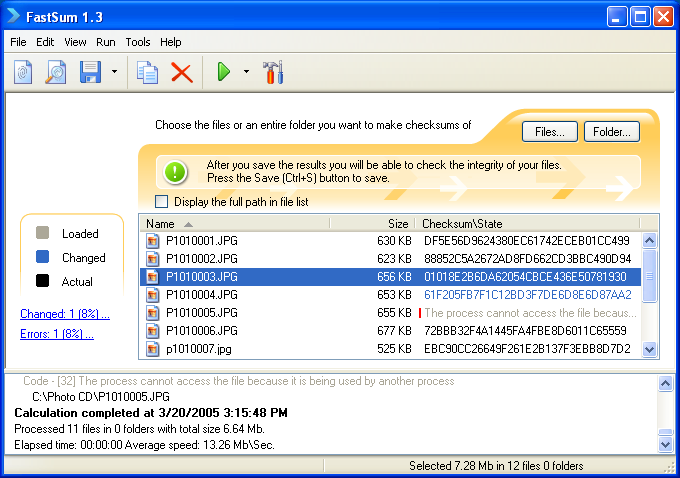 When you select files FastSum computes their checksums according to the MD5 checksum algorithm, which can be easily compared with previously computed checksums or stored for future integrity checking. There are two most important MD5 checksum properties for the end-user: the fixed size and the non-discoverability. The first property means that it does not matter how big the source file is, it always has a short 128bit MD5 checksum value that can be compactly stored and easily shared. While the second property implies that a pair of nonidentical files will have different MD5 checksum value i.e. even a short fixed size value is enough for detecting changes within the file. FastSum comes with three interfaces, from the console application to modern graphical application. So, you can choose the way that fits the situation best. The Standard Edition allows FastSum to be integrated into Windows® Explorer, which makes the access to the MD5 checksum creation and verification procedures much easier. You also are enabled to calculate the MD5 checksums for several selected files as well as for multiple folders and even entire drives. The built-in Wizards give the best fit for processing a great number of files. At that the Verification Wizard is able to find new files and calculate their MD5 checksums. The MD5 Message-Digest Algorithm 5 was designed by Professor Ronald L. Rivest in 1991 to replace the older MD4 algorithm for use primarily in cryptography. The MD5 algorithm has been used widely in many security applications as well as for the files integrity control since it was published as an Internet standard (RFC 1321) in 1992. You can clearly see from this example how the MD5 checksum changes dramatically when altering one file by just a single bit. The MD5 checksum (also called as the “MD5 digest”) has been widely used in software systems besides the data integrity checking. But did you realise that you will almost certainly have already used a system that uses the MD5 algorithm? In authentication systems, the MD5 digests are being used for important information secure storing and transmitting, like the logins, passwords etc. Undoubtedly every computer user has at least once had to enter a password to gain access to some recourse or mailbox or simply to logon the system. Properly constructed authentication systems do not store passwords in an obvious form, instead they save the password's MD5 digests and the verification process is applied to compare the MD5 digest of a stored password with the MD5 digest of an entered password. So, even in case of a malign intrusion into the system the user's passwords will remain unknown. Instead of the passwords the intruder can find out only their MD5 digests. You can check the authentication system of some web-site (it could be your favorite forum, e-mail, web hosting server, etc.) on your own, by using the password reminder function. If as a result on your e-mail you receive your current password, you should avoid using the same password on other sites. Correctly designed authentication systems do not know your password, and restoring it from the MD5 digest isn't a simple task. Therefore, on your e-mail you should receive a newly generated password or something like a link to resetting your old one. Some operating systems use MD5 for storing password digests and have the MD5-based tools in the standard distribution package. The FreeBSD box, this website is hosted on, has a native support for MD5, to learn more please read about the MD5 in FreeBSD Handbook. Linux is another well known system that uses MD5 as a default method in shadow password protection. The two other operating systems, Mac OS X and Windows use different methods of storing passwords, but nevertheless the approach is rather similar. Dave Dribin has clearly described Mac OS X authentication system in his blog and compared MD5, SHA1, and LM Hash used in Unix and Windows systems. What is the MD5 hash? * - some websites publish the files checksums for downloaded data integrity checking. Sponsored by TagTuner Music Organizer. MD5 Checksums are also used in some of the music file formats that people often listen to and simply do not know about it. At least in Flac files MD5 checksums are used for integrity control. Some other music files have CRC checksums inside. TagTuner was started as MP3 tag editor and now supports most of the popular music file formats. It full of unique features that help reducing manual typing while tagging the music collection.